The Conqueror Connection Family has evolved from the desirable Conqueror Brand of Off-Road Campers! It was a natural progression for the Conqueror Head 0ffice in Heidelberg to expand its operations from being a manufacturing based operation and shift its focus into being a Customer Service driven one stop shop business. 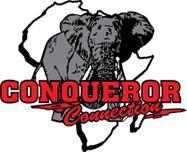 The Conqueror Connection is a group of owner run franchised businesses that focus on the individual‘s requirement when investing in an Off-Road Camper! The Conqueror Connection outlets are the ideal platform for customers to view all the Conqueror Products within close proximity to their homes. No longer will you have to travel to many miles to Purchase, Service, Hire or Simply Browse the New Innovation within the Conqueror Product Range! The Conqueror Connection brand is now driven by individuals who have been carefully selected and trained along with their passion for the Outdoors and Off-Roads. Your local Conqueror Connection outlet is now equipped with the understanding of how to tailor make the perfect package for you.